Beaders and other artisans have knowledge and ideas at their fingertips with this comprehensive reference to more than 600 individual beads that are readily available and appropriate for contemporary projects. Chapters in The Bead Directory are separated by bead material, including glass, wood, semi-precious stone, and ceramic beads. Each bead is pictured from several angles, alongside descriptions of dimensions, color range, usage, special care, size of hole, weight, suitable stringing materials, relative cost, and suggested complementary beads. An extensive index lists suppliers in stores and online, making this reference an invaluable companion for designers looking to add to their bead-bag of tricks. 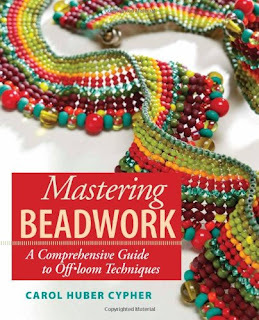 Mastering Beadwork is the ultimate resource for beading knowledge—it's a project book plus reference tool wrapped up in one. Based on years of teaching experience, Carol Cypher presents easy-to-understand instructions with informative sidebars to help anyone master beading techniques. Each of the 13 techniques are explained in detail, and then further explored with projects to enhance the beader's skills and confidence. The 63 projects included here-ranging from bracelets, necklaces, rings, and earrings to findings, closures, beaded beads, and other beaded objects-teach a single project or technique but are arranged to build skills at any level. Suggestions for personalizing and expanding on each project or pattern are also addressed. Learn all the basic beading stitches-from peyote, spiral, vertical and horizontal netting, bead crochet, right-angle weave, triangle weave, daisy chain, ladder stitch, brick stitch, African helix, and more. I would so love to win this book. Thank you so much for the giveaways and fabulous posts all of the time. Wow thank you! Been delving further into beading and this would be a great addition to that. It is always such fun having a new bead book. I keep a list of all the books you give away and the ones you feature. Looks like a really great book! this is a great giveaway ! I would love to read this book - I love to read beading books that show weaving techniques (how to's) as I am fairly new to weaving - and so far I really enjoy weaving !! I am gobbling up magazines on the subject!! Thanks for the giveaway! I would love to learn how to make these BEAUTIFUL bracelets! This would be a great start! I would love to win one of the books you are giving away; as i love to learn about everything there is about beading.Thanks again. 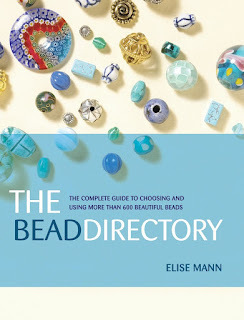 Having just begun jewelry making with beads I feel that this book would contribute greatly to my skills. I hope that I'm chosen to win this book! I'd love to win this book! Thanks for the chance! Happy Holidays too! I need all the help I can get, thank you for this opportunity !! Merry Christmas to all, and see you next year! Great Interweave books for Christmas gift-giving! Fast projects for holiday gift-giving!